LTN children are taught to love nature, the importance of the environment and how important it is to take care of and protect it. This is done by having the children tend LTN’s own nursery garden. Each of our children has the opportunity to care for the flowers and trees, water them and watch them grow. The children are taught not to throw sand or dirt on plants because it harms them. They learn how to smell and feel the different plants in the herb garden, such as mint, sage and oregano.They pick, dry and rub the herbs to make mixtures such as the Arabic treat Za’atar. The children will also plant vegetables from seeds in the nursery’s vegetable garden, watch them grow, care for them and eventually get to eat their produce. 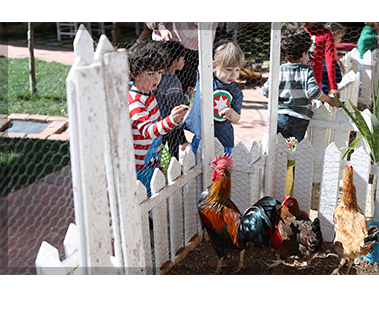 The nursery has farm animals such as rabbits, chickens and ducks and the children are taught how to care for them. For example they have a daily duty to collect the leftover food from their snacks and together with their teacher they feed the animals and give them water.This teaches them responsibility towards others, to be compassionate to animals and how to recycle their food (no wastage) as there are always others that can make use of it, in this case, LTN’s farm animals. At LTN we work hard to instill the habit of recycling, reusing and reducing in our children from an early age.